PUKALANI — The rivalry between the Lahainaluna and Baldwin high school wrestling programs added another intriguing chapter at Saturday’s Maui Interscholastic League championships at King Kekaulike Gym. The Bears won their second straight girls team title, defending the crown they took from the Lunas after the West Maui school had won eight straight. The Baldwin girls scored 148 points, 14 more than Lahainaluna. The Lahainaluna boys took advantage of nearly all the mettle they had available, winning eight individual titles among the 10 finalists they had to capture their 13th MIL boys team title in 14 years. The Lahainaluna boys scored 226 points to edge Baldwin by 10.5 points, a margin that would have been switched if one of the seven finals matchups between the Bears and Lunas had gone the other way. The Lunas’ Elijah Oliveira Kalalau picks up Kamehameha Maui’s Zachary Genobia on his way to winning the boys 170 final. None of the Lunas boys’ crowns was more dramatic than Keaka Kuaana’s victory — he pinned Baldwin’s Austin Murray in 2 minutes, 31 seconds in the 160-pound final when the tension in the gym was palpable. 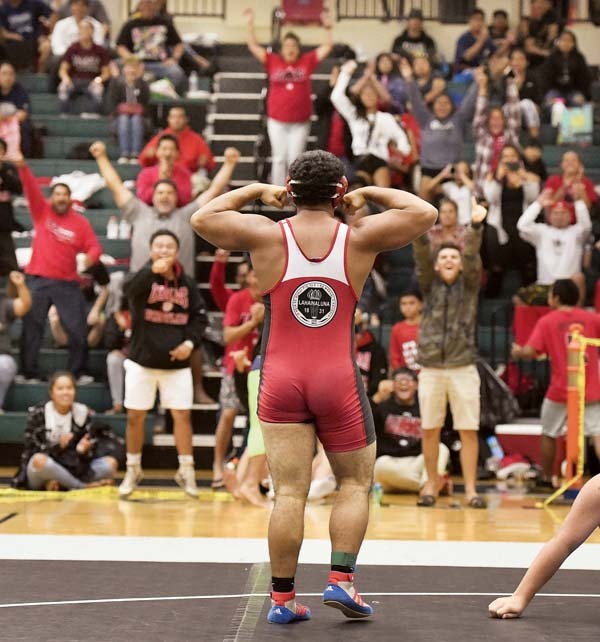 It marked not only the first MIL title for the Lahainaluna senior, but also his first trip to the state tournament. “Honestly, I’ve been fighting my hardest,” Kuaana said. “I never got to wrestle my freshman and sophomore years because I got concussed, but I came back last year and I started fighting off strong. I came short, but this year I put it in my mindset. His match was a key down the stretch as the Bears and Lunas met in seven boys finals — Lahainaluna won five of those. Baldwin’s Renele Andrion escapes from Lahainaluna’s Lydia Dudoit in the first period of Saturday’s girls 112 final. “Honestly, I just love it because it shows our boys we have got to finish this and pull it through,” Kuaana said. Lahainaluna senior Elijah Oliveira Kalalau followed Kuaana’s dramatic win with a 17-5 major decision over Zachary Genobia of Kamehameha Maui at 170. It marked the first MIL title for Oliveira Kalalau. Baldwin coach Malakai Panuve said the history of the Bears-Lunas battles — dating back to when Garner Ivey was the Baldwin coach when wrestling began in the league — is one of the more special parts of any sport in the MIL. The Lunas’ Keaka Kuaana pins Baldwin’s Austin Murray to win the boys 160 final. The Bears are the defending state champions in girls, but Panuve knows that the MIL girls title — like the boys — came within one finals match going the other way. The Lunas won three of the five finals matchups with the Bears in girls action, but both head coaches pointed to Baldwin freshman Renele Andrion’s victory via pin at 112 as being key, as it came in the fourth of 14 finals on the night. Andrion pinned Lydia Dudoit in 5:10 to claim extra team points. Dudoit won their only other meeting this season. Panuve said he couldn’t be more happy for his girls. Lahainaluna’s Kainalu Kaililaau flexes for the crowd after winning the boys 220 final. Hana’s Tuu Helekahi pins Baldwin’s Sequoia Warren in the first period of the girls 225 final. Team–1. Baldwin 148, 2. Lahainaluna 134, 3. Molokai 89, 4. Hana 16, 5. Kamehameha Maui 14, 6. King Kekaulike 12, 7. Maui High 8, 8. Lanai 0. 97 pounds–1. Liana Ferreira, Baldwin; 2. Trinity Mowat, Molokai. 102–1. Tianna Fernandez, Baldwin; 2. Nalani Kirkman, Lahainaluna. 112–1. Renele Andrion, Baldwin; 2. Lydia Dudoit, Lahainaluna; 3. Barbara Simon, Molokai. 117–1. Alicia Frank, Lahainaluna; 2. Michaelah Vasquez, King Kekaulike; 3. 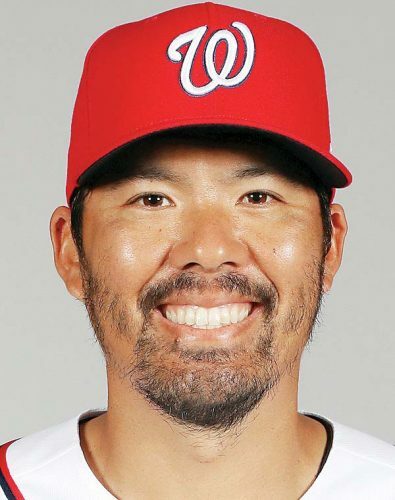 Kasey Toulze, Lahainaluna; 4. Alana Morris, Molokai. 122–1. Keeya Bicoy, Molokai; 2. Mallory Go, Molokai; 3. Laieikawai Tancayo, Lahainaluna; 4. Sierra Perryman, Maui High. 127–1. Nanea Estrella, Lahainaluna; 2. Ashlee Palimoo, Kamehameha Maui; 3. Kaytlin Naeole, Molokai; 4. Shia Anne English, Molokai. 132–1. Waipuilani Estrella Beauchamp, Baldwin; 2. Kelsey Lee Bicoy Juario, Molokai. 138–1. Jahnea Miguel, Baldwin; 2. Chaenel Deluna, Molokai; 3. Claudia Keanini, Molokai. 145–1. Tayler Peligrino Hayase, Lahainaluna; 2. Tyeisha Takamori, Baldwin; 3. Taye Mowat, Molokai; 4. Chris Ann Alejo, Maui High. 155–1. Shayna Kamaka, Baldwin; 2. Sunni Chow, Molokai; 3. Maile Kaahanui, Molokai; 4. Shalayna Moeone, Baldwin. 168–1. Fayannie Rosario, Lahainaluna; 2. Kaceylee Pua, Baldwin; 3. Janvier Bentley-Smith, Molokai; 4. Shekinah Orlando, Molokai. 184–1. Shannon Jaramillo, Lahainaluna; 2. Siera Vida, Baldwin. 225–1. Tuu Helekahi, Hana; 2. Sequoia Warren, Baldwin. Team–1. Lahainaluna 226, 2. Baldwin 215.5, 3. Kamehameha Maui 85, 4. Maui High 32, 5. Lanai 30, 6. Hana 26.5, 7. Molokai 7, 8. King Kekaulike 0. 106–1. Tobey Ravida, Baldwin; 2. Keanu Kamai, Baldwin; 3. Kapena Vitcovich, Kamehameha Maui; 4. Antonio Paulino, Lahainaluna. 113–1. Colby Ravida, Baldwin; 2. Alan Sanchez Jr, Lanai; 3. Cael Yasutake, Lahainaluna; 4. Kainoa Monkres, Kamehameha Maui. 120–1. Kanoa Lanoza, Lahainaluna; 2. Gabriel Valdez, Baldwin; 3. Aaron Sumabat, Baldwin; 4. Joshua Taguiam, Lahainaluna. 126–1. Zeff Dudoit, Lahainaluna; 2. Kahilihiwa Joy, Baldwin; 3. Kolee Pedro-Tabilangan, Molokai; 4. Manuel Hernandez, Lahainaluna. 132–1. Jesse Dudoit, Lahainaluna; 2. Jules Marinas, Baldwin; 3. Noa Helm, Kamehameha Maui; 4. Arlen Logan, Baldwin. 138–1. Kawehi Gillcoat, Lahainaluna; 2. Kekoa Catiel, Lanai; 3. Bronson Adric, Baldwin; 4. Hauoli Sineci, Hana. 145–1. Billy Treu, Baldwin; 2. Jacob Taguiam, Lahainaluna; 3. Dawson Nolasco, Lahainaluna; 4. Ryan Wetter, Maui High. 152–1. Tekoa Torres-Umi, Baldwin; 2. Derek Perez, Lahainaluna; 3. Kanoa Aruda-Starwood, Kamehameha Maui; 4. Thomas Momoa, Hana. 160–1. Keaka Kuaana, Lahainaluna; 2. Austin Murray, Baldwin; 3. Leitin Phillips Clark, Hana; 4. Justin Mina, Maui High. 170–1. Elijah Oliveira Kalalau, Lahainaluna; 2. Zachary Genobia, Kamehameha Maui; 3. Dayven Tonu, Kamehameha Maui; 4. Louis Cambra, Maui High. 182–1. Ty Bates, Lahainaluna; 2. Enoka Phillips, Lahainaluna; 3. Akuila Kolomatongi, Baldwin; 4. Kyairese Diego Pula, Maui High. 195–1. Darius Mynar, Kamehameha Maui; 2. Maake Panuve, Baldwin; 3. Nyles Pokipala-Waiohu, Lahainaluna; 4. Josaiah Megallon, Maui High. 220–1. Kainalu Kaililaau, Lahainaluna; 2. Nephi Laga, Baldwin. 285–1. Benjamin Tokanang, Baldwin; 2. Kaeo Pedroza-Kanemitsu, Kamehameha Maui; 3. Austin Saribay, Lahainaluna. Lahainaluna’s Nanea Estrella closes in on a second-period pin of Kamehameha Maui’s Ashlee Palimoo at 127.